Hi there! Can I tell you how excited I was to get this in the mail? I received an advanced copy from a publicist for review and I was so excited to read this. I saw it last fall and was immediately intrigued. I can’t wait for you guys to read it this May! two Indian-American teens whose parents have arranged for them to be married. What a cute contemporary read! I couldn’t wait to see where these characters took me, and I loved how Menon characterized them! I am not entirely one for insta-love books, and it seemed like this one might be one, but I did appreciate all that happened within these pages. I love this book so much! Dimple and Rishi made me believe in so much. I don’t think my sleep deprived brain had much more than this to type out. I enjoyed this book so much and have had some time to let my thoughts on it marinate. One thing this book champions is the strength of Dimple as a female. I love it when female characters are hard on asserting themselves and there are always many obstacles that they face when this happens. I appreciated Dimple’s initial prickliness toward Rishi! Their first meeting is probably one of my favorite scenes in the book, especially seeing it from both sides of the story. Rishi reminded me a bit of myself. I am a romantic (though not a hopeless one, and certainly not as much as Rishi), and I loved seeing him persist throughout this book. It was interesting to watch him develop as a character and more than just a boy in love. He’s sweet and kind, and I like that he doesn’t become overbearing and demanding of Dimple. He gives her room to be herself and appreciates her even more for her genuineness. I cannot speak to how accurate this story was to Indian culture. I imagine, however, that with the author’s background that it was, at least to some extent, accurate. I like that it took the taboo idea of arranged marriages and made it something that the reader could understand in modern context. I think that people are really quick to judge arranged marriages, especially in the United States because we don’t understand it and what it means to people today. I think Menon did very well demystifying this for us, and I really loved the way she did it. This is definitely one I’ll be rereading! I can’t wait to read it this summer again. Amber Sand isnot a witch. The Sand family Wicca gene somehow leapfrogged over her. But she did get one highly specific magical talent: she can see true love. As a matchmaker, Amber’s pretty far down the sorcery food chain (even birthday party magicians rank higher), but after five seconds of eye contact, she can envision anyone’s soul mate. Amber works ather mother’s magic shop–Windy City Magic–in downtown Chicago, and she’s confident she’s seen every kind of happy ending there is: except for one–her own. (The Fates are tricky jerks that way.) So when Charlie Blitzman, the mayor’s son and most-desired boy in school, comes to her for help finding his father’s missing girlfriend, she’s distressed to find herself falling for him. Because while she can’t see her own match, she can see his–and it’s not Amber. How can she, an honest peddler of true love, pursue a boy she knows full well isn’t her match? The Best Kind of Magic is set in urban Chicago and willappeal to readers who long for magic in the real world. With a sharp-witted and sassy heroine, a quirky cast of mystical beings, and a heady dose of adventure, this novel will have you laughing out loud and questioning your belief in happy endings. This book was so cute! Amber is a spunky and hilarious narrator throughout the entire novel. I really enjoyed getting to know her and the other characters through her point of view. At first we start off with Amber being really unsure of herself and while she enjoys her matchmaking skills she doesn’t want to be a matchmaker only – she wants to be a baker. I love that there were other things that Amber was interested in and that she didn’t let her magic be the only thing that defined her. She becomes a more confident young woman as the story continues and I really liked that character development. Amani was definitely one of my favorite characters. She’s complex and different and I can see where Amber would be frustrated with her as a best friend. However, I love their friendship and how they’re always there for each other even when things get a bit hairy. They support each other in ways that you want best friends to be there. Here is the playlist I selected for the book! I picked these because they reminded me a lot of Amber and the plot, especially the end! Enjoy! 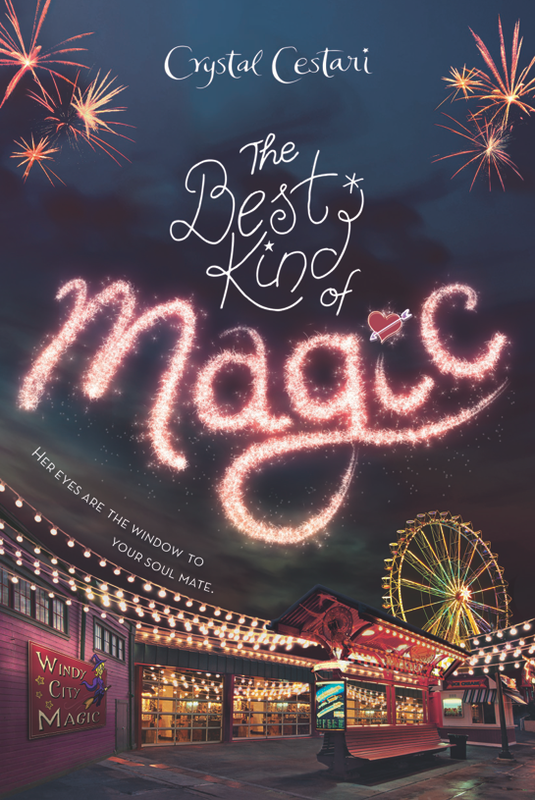 We are giving away one (1) finished copy of The Best Kind of Magic by Crystal Cestari. This is open to US and Canada only and ends on May 26th. You can follow the rest of the tour for more opportunities to win, however you may only win once! Click here to enter the giveaway!